Murphy and Synder Press, Maynard, Mass. GUNS, FISTS, OR WOT HAVE YOU? Hudson Line-Up: Tom Merrick, Sid Walsh, Bill Tate, Charboneau Gately. The rest are better. You might as well stop being a fan. Two posters (damaged), 14 x 22 in. 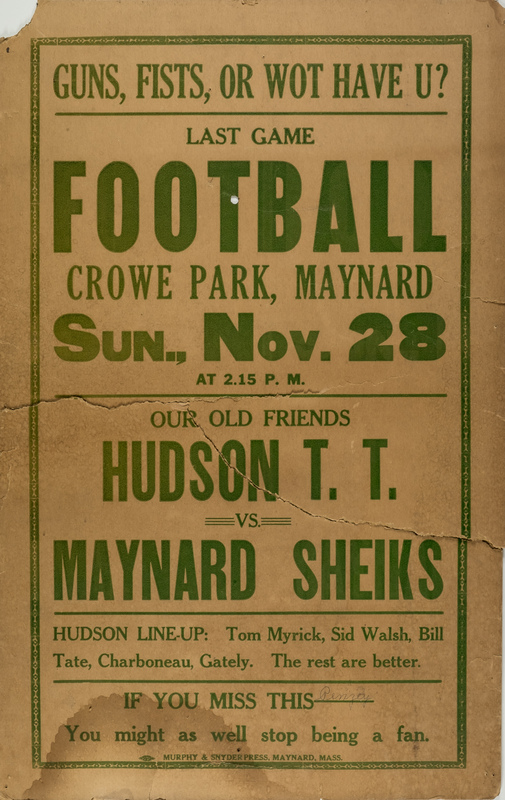 Murphy and Synder Press, Maynard, Mass., “Poster for Football Game: Hudson T.T. 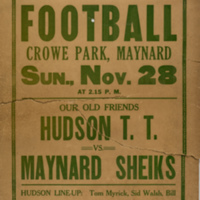 vs. Maynard Sheiks,” Maynard Historical Society Archives, accessed April 23, 2019, http://collection.maynardhistory.org/items/show/5344.